Tyrone edged out Ulster rivals Cavan in a closely contested Football League Division Two contest at Healy Park. The teams were tied at five points apiece at half-time but the Red Hands ran out 0-10 to 0-08 winners in a game played in difficult conditions. 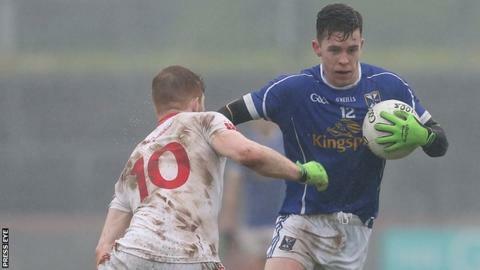 Lee Brennan scored three points in the first half but Tyrone failed to shake off Cavan until late in the match. Justin McMahon and Connor McAliskey pointed within 30 seconds to make it 0-10 to 0-7, then Killian Clarke replied. Goalkeeper Michael O'Neill made his debut for Tyrone, while Darren McCurry was handed a start and Mark Bradley was drafted in to play instead of Peter Harte, who came on as a second-half substitute. Brennan (3), Bradley and McAliskey were the point-scorers for the hosts in the first half, with Niall McDermott, Martin Reilly (2), Eugene Keating and Gearoid McKiernan registering scores for the Breffnimen. McKiernan added his second after the break, but Mattie Donnelly, Rory Brennan and McCurry responded to nudge Mickey Harte's outfit two points ahead. Cian Mackey reduced the deficit to a point, but that quickfire double from McMahon and McAliskey gave Tyrone some breathing space and they saw out the game, despite Clarke's late consolation. Tyrone are away to Galway next week, with Cavan at home to Derry in another Ulster derby. Tyrone manager Mickey Harte: "That was a hard-fought victory played in difficult conditions and very inclement weather. Fortunately we came away with the two points. "The number of wides is a concern for us, the percentage of scores from shots taken and from free-kicks, but that will take time. "Today was all about the result but there is lots of work to do in terms of our performance and things we can do better."